At the heart of the ReGenesis™ Hair Enhancing System, the ReGenesis™ Fast-Absorbing Foam has an advanced formula that features proprietary BioPeptin Complex® and is designed to enhance the volume and beauty of hair. Lightweight foam allows for fast application, easy spreadability and quick dry time. Ideal for shorter hair types and men. It is recommended to use your preferred ReGenesis Hair Volume Enhancer once daily, preferably after hair has been washed and is slightly damp. Use once daily. Remove safety seal and cap. Pump the bottle a few times to release air, until the foam appears from the pump. After cleansing hair release a small amount of foam onto your fingertips and massage the product into the hair. This product is a leave-in, do not rinse. Let hair dry, and style as desired. 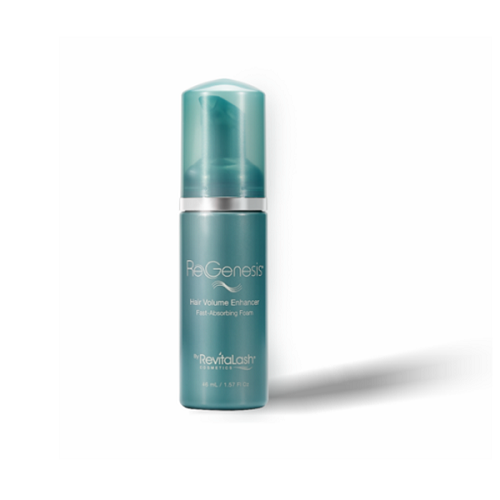 For best results use as part of the ReGenesis™ Hair Enhancing System. Aqua, Acrylates Copolymer, Glycerin, Phenoxyethanol, Sodium Cocoyl Glutamate, Chlorphenesin, Polysorbate 20, Aminomethyl Propanol, Disodium EDTA, Parfum, Biotin, Panthenol, Dechloro DDihydroxy Difluoro Ethylcloprostenolamide, Panax Ginseng Extract, Ginkgo Biloba Extract, Triticum Vulgare Germ Protein, Serenoa Serrulata Extract, Swertia Japonica Extract, Hexyl Cinnamal, Limonene. Jack Black Body-Building Hair Gel 3.4 oz.